Wild West Cowboy 9 pc baby bedding ensemble will help your little boy kick up his heels and drift off to dreamland like a real cowboy. This striking baby bedding set uses a collection of exclusive JoJo Designer Prints. The coordinating fabrics include 100% Cotton JoJo Cowboy Print fabric, Brown and Cream Cow Print, Red Bandanna Print, Plaid, Denim, and Chocolate Micro suede. 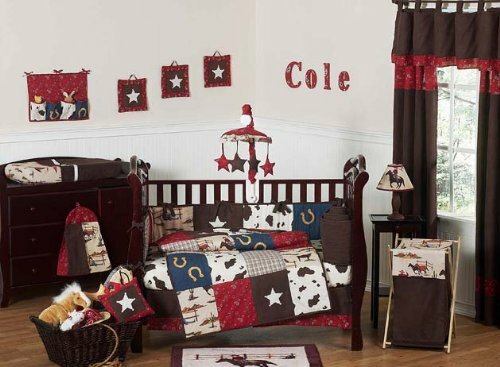 Detailed with embroidered horseshoes and sheriff stars, this set will create a western theme room that your little cowboy is sure to enjoy. This western horse bedding set is made and fits all standard size cribs and toddler beds.